We're really pleased with the recent round of comments to the Matt Eagles recruitment post. So, thanks to you the readers, let's foster the conversation and throw it back to you again. Is St. Thomas' men's hockey program on the right course with the current recruits to date? Do you think that being a small liberal arts university handicaps Mike Eagles as a recruiter or can it be an advantage if "sold" correctly? The Tommies had a less than optimal 2008-09 season, so what holes in the current line up need to be filled, if any? If you think there are holes, what positions and with who should Mike fill them with? Can St. Thomas compete for the AUS championship this coming season? Answer how you see fit. There are no right answers and your opinions on this subject make for better reading than mocking each other's spelling ability and favourite team preference. Again, good work with the recent comments. St. Thomas University men’s hockey team is pleased to announce that forward Jadran Beljo from Sudbury, Ontario has committed to the Tommies for the upcoming season. “I like to help out the team any way I can but my best assets would probably be setting up and finishing plays in the offensive zone. I'm excited to come to St. Thomas to rebuild and hopefully be a part of a winning team for the next few years. I look forward to getting my education in a beautiful city, and rebuilding to hopefully bring back a championship to St. Thomas in the near future.” said Beljo. Jadran is an offensively gifted forward who has played five seasons in the OHL. Beljo had consecutive 30+ goals seasons with Mississauga and London in 06-07 and 07-08 respectively. 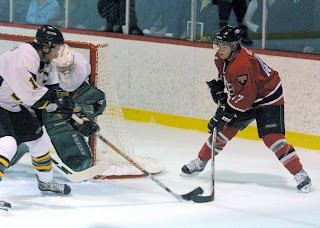 The Tommies are excited to have Beljo on board as they look to rebuild the team after missing the play-offs in 08-09. "Jadran is the type of quality player and person that the Tommies are looking for. He is an intelligent player that has a very good stick and skates well. We are really looking forward to having him in our lineup," said Head Coach Mike Eagles. Photo Credit: Official OHL site.